Janet Kurnatowski is pleased to present “Drawing Into Paint”, new works by Margrit Lewczuk. Included in Lewczuk’s first solo show with the gallery will be a selection of paintings, and over sixty works on paper that are either drawn, painted, collaged or woven together. The show runs from April 29 - May 29, 2011. There will be a reception for the artist on Friday, April 29th, 7-9pm. Lewczuk has been in numerous solo and group exhibitions, including P.S.1 Museum, Betty Cuningham Gallery, Matthew Marks Gallery, Pamela Auchincloss Gallery, Sideshow Gallery and Parker’s Box to name a few. 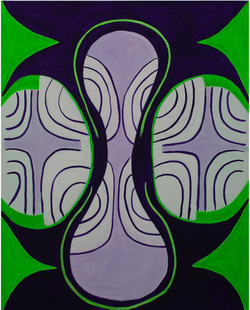 She has been awarded the Esther and Adolph Gottlieb Foundation Grant, Raushenberg Foundation, Guggenheim Fellowship Grant, National Endowment for the Arts Artist's Fellowship and the CAPS grant. For more information or images please contact the gallery.